Anjela Contreras is a second grader at South Street School in Manorville. Earlier this year, she saw a video on YouTube of a girl her age cutting and donating her hair to make wigs for kids with cancer, and was inspired to do the same. In June, she visited the office and was partnered with Donna, our receptionist, who had recently donated her own hair for children experiencing hair loss as a result of cancer or other health issues. At her most recent visit, Anjela returned with a beautiful short haircut and two long ponytails measuring in at 14" each! The hair donations are being sent to Wigs for Kids, who affirm in their organization's mission statement "Children shouldn't have to worry about how they look, especially when they're in the middle of a health crisis." 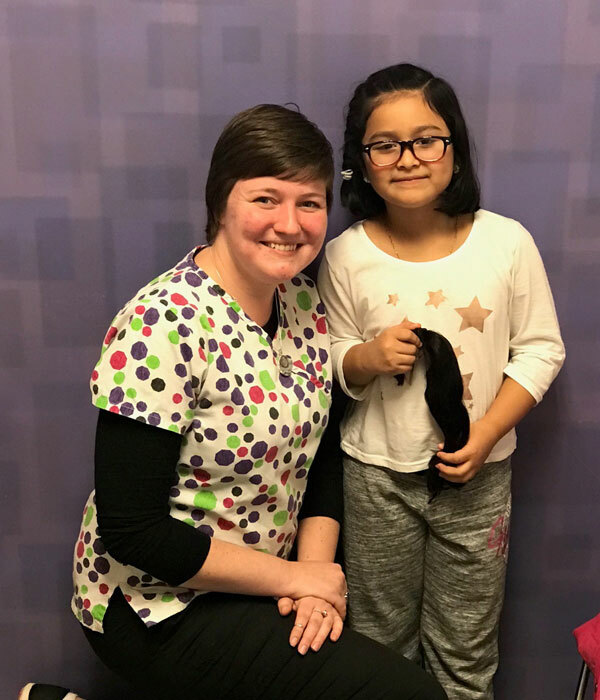 Wigs for Kids does not charge the patient or their family for the child's wig, and relies on the generosity of people like Anjela to donate hair or money to the organization. Anjela's sister, Melva, plans to do the same in the near future. Great job Anjela, we are very proud of you!